Nerja is situated on the coast, at the foothills of the dramatic Sierra Almijaras mountains about forty five kilometres (a 40 minute drive) east of Malaga on the Costa Del Sol. Although Nerja is a popular tourist resort it has managed to keep its Spanish character, particularly the old part of town with narrow cobbled streets and Tapas Bars. English is fairly well spoken but it remains a working Spanish town. All the normal things are here beaches galore (some very private and others more commercial having restaurants and water sports facilities), supermarkets, chemists, doctors, two weekly markets and loads of bars and restaurants. 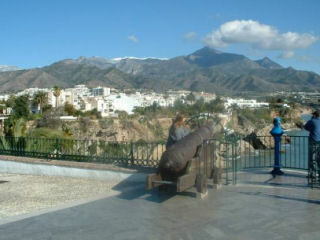 The Balcon de Europ is in the centre of the town and is the focal point of Nerja nightlife. During the summer months this promenade teams with entertainers, artists, dancers and stalls of all descriptions. The town centre with myriad shops makes good early evening browsing before settling down in one of the many fine bars and restaurants serving traditional Spanish and international dishes. A short drive or cab ride from Nerja there is lots to see and do; the caves at Maro, inland villages and a little further afield, Nerja is only two hours drive from the Sierra Nevada (Europe's most Southerly Ski resort) Also two hours drive is Granada and the Alhambra Palace. This 2 bedroom house is located in a quiet sunny spot on a pretty complex with 2 swimming pools. Located on the east side of the town, it is an easy 10 minute walk to the heart of the town, passing many restaurants and shops on route. The nearest paper and grocery shop is just 1 minute and the nearest supermarket is 3 minutes walk away. Burriana Beach (reputedly Nerja's finest with several great restaurants, bars, cafes and shops) is just 5 minutes away, down hill all the way! It is a steady climb either up the road or up steps back to the house. Courtyard outside front door with sunny seating area for relaxed breakfasts! Bed linen and bathroom towels are provided and changed weekly. Changeover day during peak season is strictly Tuesdays. Although, the apartment sleeps 4 people, it is normally possible to put an extra bed in the apartment, if required for a 5th person if a child.